Inquiries become sales. Are you getting your share? Business-to-business sales lead tips and tactics: use these four tips to establish winning sales relationships with prospects. As a sales and marketing consultant who specializes in B2B sales leads, I’ve had the opportunity to personally review dozens of research studies about inquiry handling, inquiries and sales leads. All the research points to the same conclusion about inquiry handling: Although nearly one-in-four inquiries result in a sale within six months, the majority of sales are in the longer-term leads. Consider a research study conducted by Reed Business Information about inquiry handling. It took a look at 40,000 inquiries from ads and press releases in magazines serving the manufacturing marketplace. 23 percent had bought the product or service advertised from the advertiser or a competitor. 67 percent said they were still in the market planning to buy. 11 percent purchased within 3 months of inquiring. 17 percent purchased within 4-6 months. 25 percent purchased within 7-12 months. 47 percent took more than a year to buy. Unfortunately, despite the high number that eventually convert to sales, many salespeople believe that advertising inquires are not worth following up on. Why? Probably because a majority of these inquiries are from longer-term prospects, and salespeople generally need more immediate sales in order to meet monthly or quarterly quotas and earn commissions. As a result, if your company’s inquiry handling process simply passes all inquiries on to your salespeople, reps, dealers or distributors for follow up, beware: They’re probably neglecting the longer-term prospects and, as a result, your company may be leaving as many as 8 out of 9 sales on the table for your competitors with better inquiry handling. Show how responsive your company is by sending requested information immediately. Use the phone to follow up with all inquirers to learn about their needs, authority, budget and timing. Use ongoing direct mail, e-mail, faxes and telephone calls to keep in touch with your longer-term prospects. This will keep your company and its products “in sight and in mind” and allow you to “spoon feed” your prospects with information about the features and benefits of your products or services. 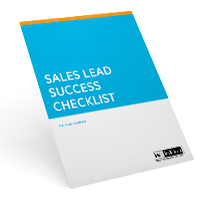 When you determine that specific prospects are ready to buy or meet with sales, get your salespeople involved. To use an analogy, imagine your marketplace is like an orchard full of fruit trees. Your marketing people are the orchard tenders; planting, weeding, feeding and watering the trees. When the fruit is ripe, they call in the fruit pickers; your salespeople, reps, dealers or distributors. If enough trees were planted (advertising) and the orchard was well tended (follow up), there will be a bountiful crop of fruit to be picked (sales). If not, the pickings will be slim.